Moscow native Karen Khachanov outclassed Adrian Mannarino to ease to his second ATP World Tour title of the year in straight sets at the Kremlin Cup. 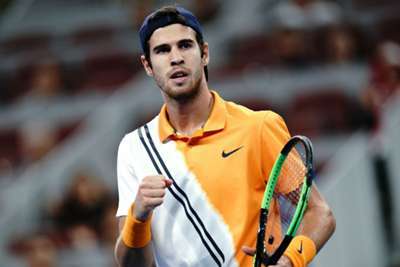 A hugely one-sided final on Sunday saw Khachanov add to his triumph in Marseille in February, with Mannarino unable to stay with the third seed in a 6-2 6-2 reverse in Moscow. Victory means Khachanov is the first Russian winner of the men's singles draw at the Kremlin Cup since Mikhail Youzhny in 2009. Khachanov broke in front early and kept the pressure on in a dominant display, earning a second break with a sensational return into the corner of the court after a series of strong showings in the rally. The home star served out the opening set with ease and soon set about building on his advantage. A swift break followed in the second due to Mannarino's double fault and Khachanov then took the third of three break points to nudge further clear, before denying the Frenchman a belated response with some powerful serving. And from a position of strength, Khachanov was able to cruise through the remainder of the match and celebrate a popular win.